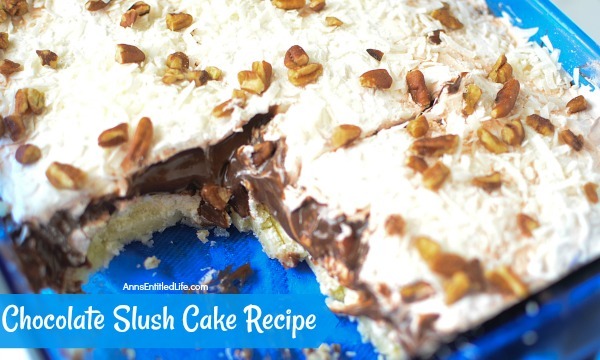 Rich, cool, creamy, and decadent, this chocolate slush cake is a great dessert to serve family and friends any time of the year. 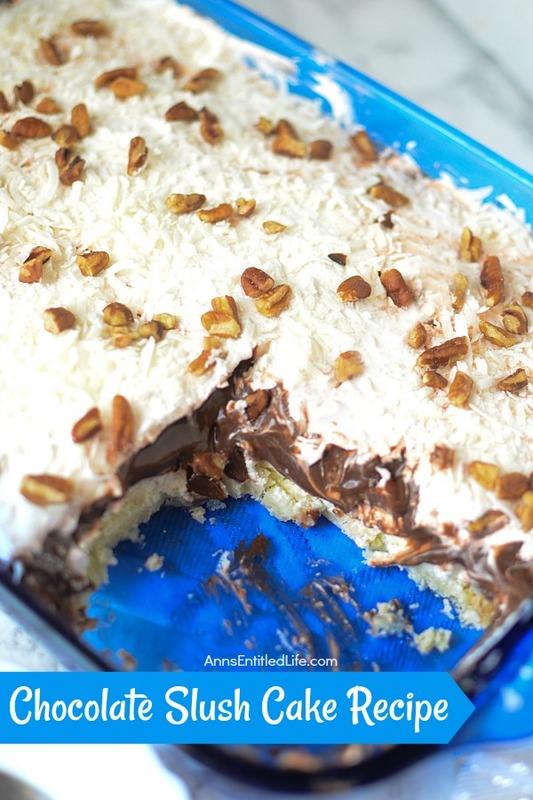 This is a delicious layered pudding cake that simply melts in your mouth. My grandmother made this “cake” all the time. Memorial Day? Had it. Labor Day? Served it. Thanksgiving? On the table. It is very easy to make, and no one else seemed to ever make anything similar. Nearly everyone loved it – pudding + smooth cream cheese; what’s not to love? So, my grandmother made this often, and it was served a lot in my family. When my mother gave me one of my grandmother’s recipe files (my grandmother had a few), this forgotten recipe was inside. I decided to share the wealth (so to speak!) and post this recipe. I hope you enjoy it as much as my family has. • My grandmother made this as long as I can remember. I would suspect (but do not know) that it may have been a recipe from Kraft. Back then “whipped topping” was cool whip and nothing else. If there were generics, I never saw them. So that leads me to believe this recipe was either from Kraft or a woman’s magazine that had a tie-in to Kraft. Today, we have generic substitutes, so the original “imitation whipped topping” stands. • This is not a traditional cake or cheesecake. A pudding-cake would be the best way to describe it. While it does set, it is not always a clean lift from the pan. I recommend making the day before and allowing this to sit (refrigerated of course) overnight. If you would like to serve for dinner, make it in the early morning and give this cake the full six-hours to set. 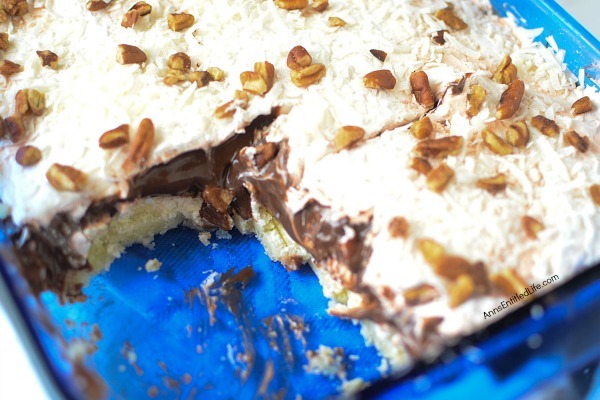 • Mix together 1 cup flour, ½ cup margarine and ½ cup chopped nuts as if you were making a pie crust. • Pat crust mixture into the bottom of a 13″x9″ pan. • Bake in a preheated 350° for 15 minutes. • Allow crust to cool completely. • Using a stand mixer, mix together 8 ounces of cream cheese and 1 cup of confectioners sugar until smooth. • Add in one cup imitation whipped topping (8 ounces); mix well by hand. • Spread cream cheese mixture evenly over the baked (and cooled) crust. • Using a stand mixer mix together 2 packages (small) instant chocolate pudding and 3 cups milk (cold). • Beat together 2-5 minutes. • Pour over cream cheese mixture in pan, spread evenly. • Top with remaining whipped topping. 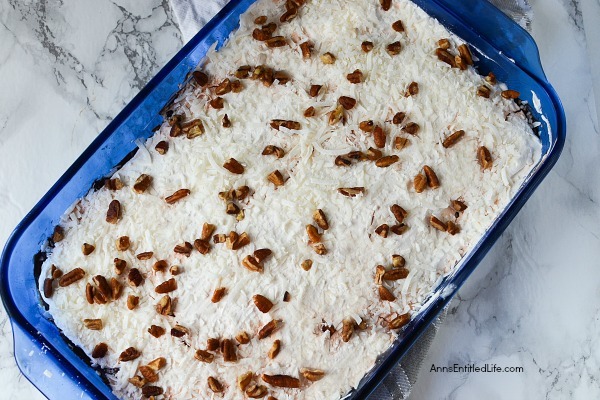 • Sprinkle with chopped nuts or coconut or both. • Refrigerate at least 6 hours before cutting and serving. 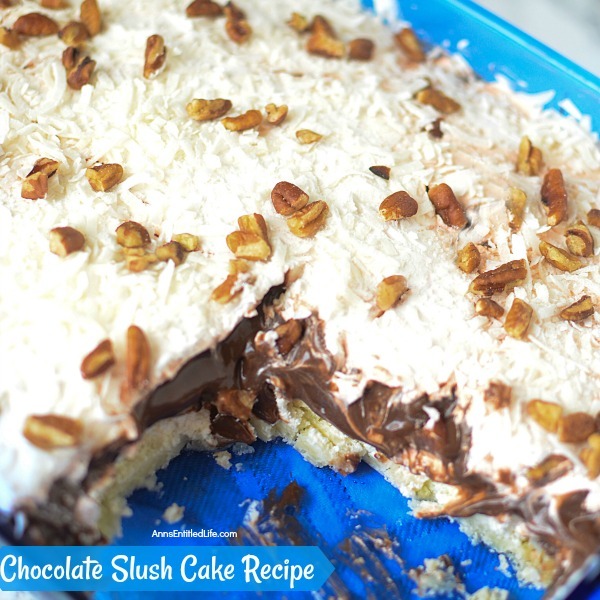 • To print the Chocolate Slush Cake recipe click here. You said to use one 10 oz cool whip, in the recipe, you state to add cool whip to the pudding and mix by hand. Then later you say to top the cake with the remaining cool whip. What remaining cool whip? I fixed it Emma, thanks for letting me know. Oh, and if you think 2 ounces is not enough to spread over the top you may want to consider getting a larger whipped topping container so you will have more to spread over the chocolate. Thanks Ann, it looks delicious and I can’t wait to try it. 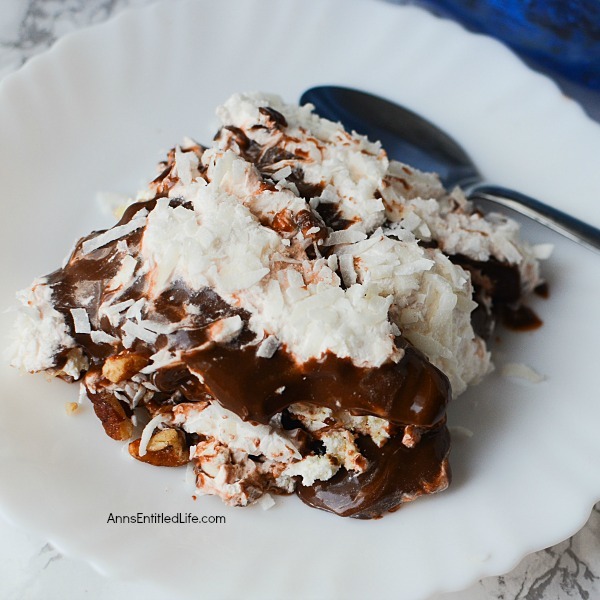 This looks delicious and not too difficult to make. I have a lot of American recipes so my friend bought me a set of measuring cups and spoons when I was last there in November. I did find out some years ago, what confectioners sugar was. Thanks for another great recipe that I will give a go.